*Data taken from official Sigma Tau Delta Honor Society website on 3/22/2013. At graduation, all students deserve to be recognized and rewarded for their hard work and achievement. For those students who have achieved particular success in studying English, the English honor societies offer membership and the opportunity to don a special honor cord for commencement exercises. The English honor society honor cord appears as one black honor cord and one red honor cord tied together, and may be worn with or without the honor society graduation stole. You may also want to consider our red with black braided cords or our black with red braided cords as an interesting and creative alternative for your students. Our black and red double tied cords are made from all synthetic materials, ensuring that your graduate may cherish academic memories for years to come. Please note - we are in no way related to the Sigma Tau Delta website or the cords that they offer. 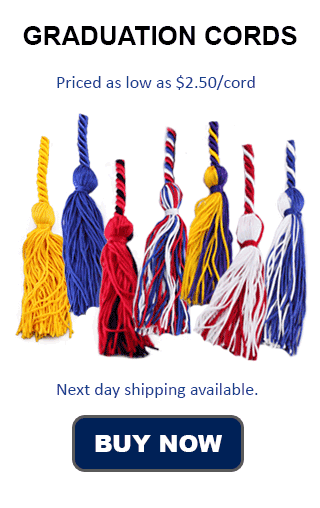 With no minimum order requirements, plus options for next day delivery, you know you're getting the cords you need at the price you want when you buy from Honors Graduation. In order to qualify for membership in one of the prestigious English honor societies and wear their academic honor cords, students must meet several academic requirements, including maintenance of a high grade point average throughout their English classes, achieve approved academic standing in their class, and take several difficult, upper-division English and literature classes for their major. Once membership has been granted, English students are allowed to don the graduation cords and apply for other, more specific honors. The English honor societies strive to encourage students in their academic interests, as well as provide opportunities for continued education and growth. By offering your graduates the opportunity to wear the English honor society graduation cord, you are inviting them to participate in a tradition of honor and success. The red and black double cords we provide will look professional with the traditional black graduation robe. After achieving such high success in their English studies, nothing could give students a great sense of honor and pride than being permitted to don the Sigma Tau Delta graduation cord. Make honor cords from Honors Graduation the finishing touch in your graduate's commencement ensemble, and show them your love and encouragement as they embark on the next phase of their educational journey.